The Board sustained two oppositions filed by Gucci America, Inc., finding the marks shown immediately below, for electronic cigarettes, likely to cause confusion with the "exceedingly famous" GUCCI and GUCCI "signature" marks for a wide variety of goods and services, including leather goods, jewelry, and perfume. The opposed marks include the name "Uberto Gucci," great grandson of the founder of the GUCCI brand. Gucci America, Inc. v. UGP, LLC, Oppositions Nos. 91223733 and 91223735 (July 13, 2018) [not precedential] (Opinion by Judge Michael B. Adlin). The Strength/Fame of Opposer's Marks: Applicant conceded that the GUCCI mark is famous. The Board found that "[i]n fact, GUCCI is a household name." The evidence established that GUCCI is "exceedingly strong, famous, and entitled to a broad scope of protection against confusion." Fame, when proven, plays a dominant role in the du Pont analysis, "independent of the consideration of the relatedness of the goods." 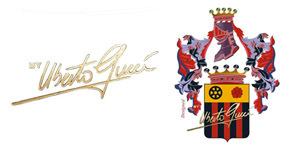 The Marks: Given the fame of the GUCCI and GUCCI "signature" marks (see below), "the Act's tolerance for similarity to those marks is quite low." Here, the degree of similarity between the marks is "quite high." The appearance of the phrase "by Uberto" before GUCCI in applicant's marks is of little significance. "Gucci" is an obvious and famous surname, and Uberto is an obvious Italian-sounding personal name. Any claim that "By Uberto Gucci" would distinguish the marks was belied by the evidence. Uberto Gucci is related to Guccio Gucci, the founder of the GUCCI brand, and he is a former vice president of the Gucci Parfums Spa. Applicant admitted that the familial connection is public knowledge. It would be natural for consumers to assume that Uberto is still affiliated with the source of other GUCCI products. Moreover, the evidence showed that major fashion brands sometimes introduce "secondary" or "diffusion" product lines by adding a term to a house mark: e.g., Balmain's secondary line "Pierre Balmain." As to applicant's shield mark, applicant admitted that the design element of this mark was created "with the 'use' of the Gucci family crest." (shown immediately above). The Board found the differences between this mark and the GUCCI word and "signature" marks to be "not particularly significant" in view of the word portion DESIGNED BY UBERTO GUCCI. In any case, the Board found the two crest designs to be similar in appearance: both feature a human figure, flowers, armor, shields, and a helmet or crown. Finally the Board found applicant's marks to be similar to opposer's registered mark FLORA BY GUCCI. Given the fame of the GUCCI mark, consumers will likely perceive BY UBERTO GUCCI and FLORA BY GUCCI as brand or product extensions. The Goods/Services: The evidence showed that Opposer "has a proven ability to offer, and a business practice of offering" a wide variety of goods, including cars, bikes, pens, money clips, mobile apps and other products "no more different from the clothes and handbags for which Opposer is perhaps best known than electronic cigarettes." Therefore, it would not be a stretch, at all, for consumers to believe that Opposer -- which offers goods somewhat similar in kind or manufacturing requirements to electronic cigarettes (including essential oils and pens) -- could offer electronic cigarettes under the GUCCI Marks, given that it has already offered, if not everything under the sun, then at least an atypically wide range of products and services. Although opposer is a famous "luxury" brand, many of the goods in its registrations (including essential oils, money clips, and pens) are without any limitations in price, type of consumer or otherwise. These relatively inexpensive items could be sold in, for example, convenience stores or drug stores that might also offer electronic cigarettes. The Board noted that its determination must be based upon the "least sophisticated purchasers" for the goods. Consumers could well assume that BY UBERTO is a new line of GUCCI products. The inputs, know-how, and manufacturing or licensing abilities needed to offer essential oils and pens would not be substantially different from what would be required to offer an electronic cigarette. In short, given the “known” family connection between Uberto Gucci and the famous Gucci family, Opposer’s history and fame, the nature of the goods and similarity of the marks, we find source confusion likely between, at the very least, Applicant’s mark UBERTO BY GUCCI for electronic cigarettes, and Opposer’s marks FLORA BY GUCCI for “essential oils for personal use” and “perfumes” (Reg. No. 3627729) and GUCCI for pens and moneyclips (Reg. Nos. 1093769 and 1200991). Moreover, opposer's evidence showed that electronic cigarettes are sometimes marketed as luxury items or to style-conscious consumers, further supporting opposer's likelihood of confusion claim. Conclusion: The Board found confusion likely, and so it sustained the oppositions. TTABlog comment: I don't think the crests are similar, do you? So is Uberto Gucci allowed to sell products w/ the symbol or not? Yes, until a court says otherwise. The TTAB decides only the issue of registration, not use.